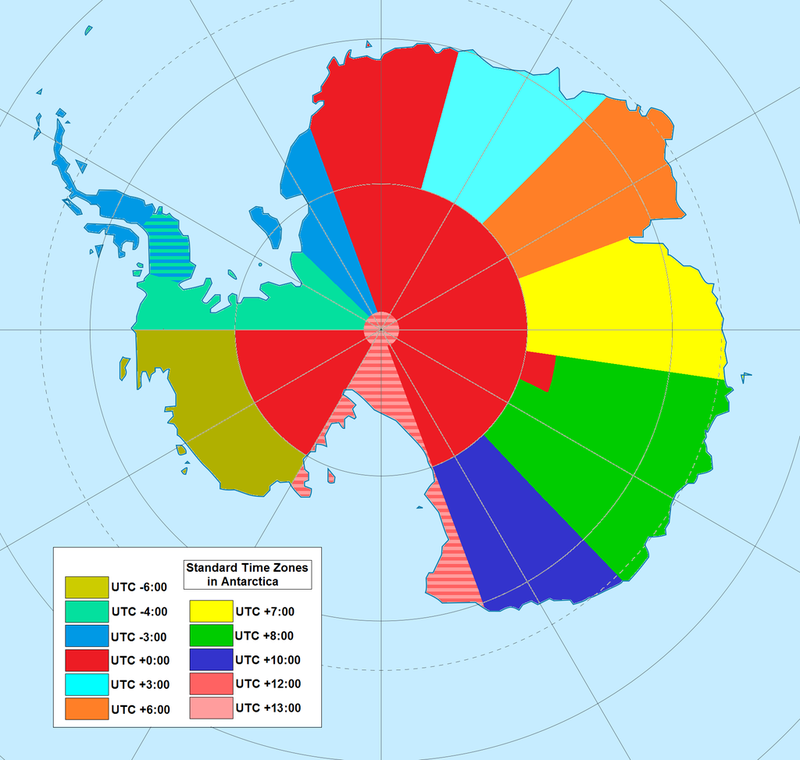 "I'll bet you a (beer/bourbon/whatever) you can't guess how many time zones there are in Antarctica. And I'll give you three guesses." With three guesses they'll probably go for it (or someone in the group will). One guess will be "24" because the continent spans all of the lines of longitude. That's wrong. A second guess will probably be "1" because Antarctica isn't a country. But it does have time zones, established by the occupying countries. Then they will have to make a wild guess. It probably won't be the correct answer: 10 or 11. "Which country - with its dependent territories - covers the most time zones?" Russia, of course, with its immense east-west span, covers almost half the planet. But it doesn't have territories in the other half. So which country and its territories are in the most time zones? Take a guess before looking at the link. Wrong. You owe me a drink. I think the striped ones are overlap/disputed areas, but I don't have time to dig into it, so I've amended the text to accomodate the uncertainty. Honest to... Deity... Stan. I guessed France. But then, ever since I discovered Kerguelen Island, I've taken note just how far-flung French territories are. BTW, the Google Maps coverage of Port-aux-France is actually pretty good. Would you believe they have a Route 66 there? Wrong? You do me a dis-service, sir, surely you know that any of us who read your writings would be sufficiently well equipped, mentally, to know the correct answer?